When God wanted to act on his promise to save the world, he started with a family and gave them a mission. He spoke to Abram and his household and they became a family on mission. We see Jesus operating in the same way, gathering an extended-family-like group of disciples around himself before embarking on his mission. Jesus needed a family on mission. Within the Trinity, the unity of God is expressed in a diversity of persons, which means that at the very heart of God's nature is family on mission. And thus God's preferred mode of operation has always been family on mission. In fact, discipleship doesn't really work apart from the context of a family on mission. Without that texture, discipleship becomes programmatic and mechanical, not really producing people with the character and competency of Jesus. The good news is that today, Jesus our Brother and King is wanting to empower us to live as covenant families caught up in kingdom mission. It seems that the Holy Spirit is moving us away from the destructive dichotomy of Family OR Mission, where we can only do one or the other, away from the band-aid fix of Family AND Mission, where we keep them separate and manage boundaries and margins, toward the integrated life of Family ON Mission, where we wholeheartedly embrace being part of a covenant community AND with those people play our part in God's kingdom mission. 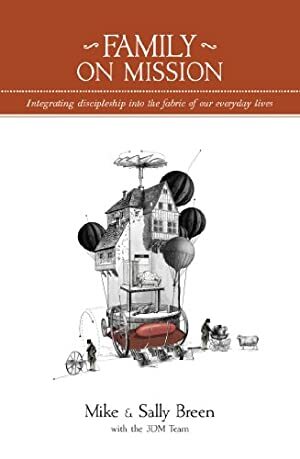 This book is about our journey in leading a family on mission, as well as looking deeply at how Jesus built his family on mission in the Gospels, as well as practical strategies for growing as a family on mission, imitating Jesus as his disciples. Track It. This book has been $1.64 within the past year. Log In to track Mike Breen on eReaderIQ. to be notified each time the price drops on any book by Mike Breen. to stop tracking Mike Breen. We started tracking this book on May 22, 2014. The price of this book has changed 63 times in the past 1,794 days. The current price of this book is $7.46 last checked 19 hours ago. This lowest price this book has been offered at in the past year is $1.64. The lowest price to date was $1.64 last reached on February 11, 2019. This book has been $1.64 one time since we started tracking it. The highest price to date was $9.99 last reached on July 23, 2018. We last verified the price of this book about 19 hours ago. At that time, the price was $7.46. This price is subject to change. The price displayed on the Amazon.com website at the time of purchase is the price you will pay for this book. Please confirm the price before making any purchases.